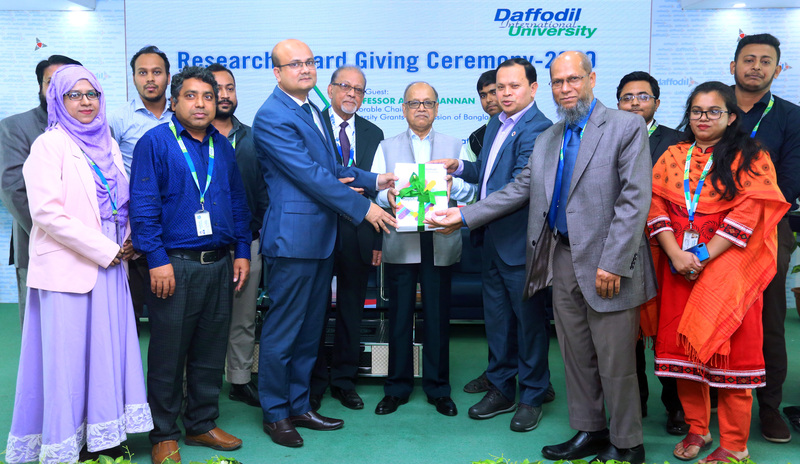 Professor Abdul Mannan, Chairman, University Grants Commission of Bangladesh (UGC) handing over the best Research Award winning department to Professor Dr. Touhid Bhuiyan, Head, Department of Software Engineering (SWE). Dr. Md. Sabur Khan, Chairman, Board of Trustees and Professor Dr. S M Mahbub Ul Haque Majumder, Acting Vice Chancellor of the university were also present in the program. Software Engineering Department of Daffodil International University achieved best Research Award for 2018. 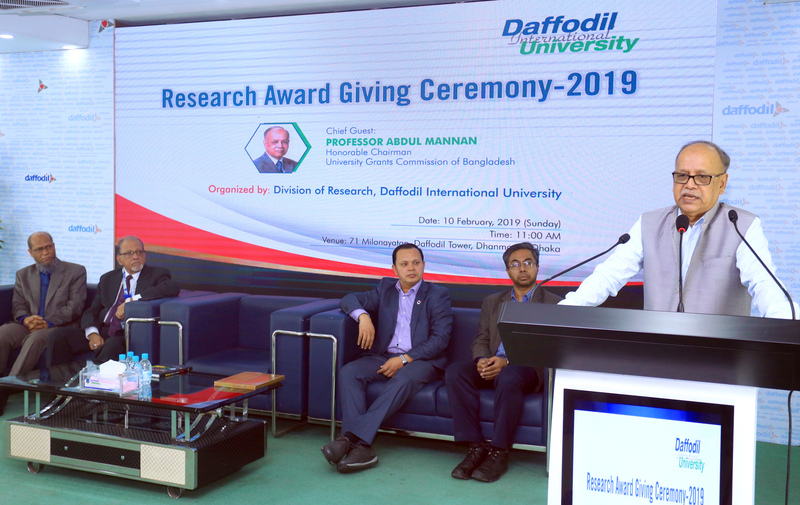 Daffodil International University organized ‘Research Award Giving Ceremony-2019’ today on 10 February 2019 at 71 Milonayoton of the university. Professor Abdul Mannan, Chairman, University Grants Commission of Bangladesh (UGC) was present at the program as the chief guest while Dr. Md. Sabur Khan, Chairman, Board of Trustees, Daffodil International University presided over the program. This event was organized to acknowledge a total number of 188 Scopus/ISI indexed research papers which have been authored by 230 DIU Faculty Members in 2018. Beside this Professor Dr. Akther Hossain, Head, Department of Computer Science & Engineering (CSE), Professor Dr. Touhid Bhuiyan, Head, Department of Software Engineering (SWE) and Mr. Bikash Kumar Paul, Lecturer, Department of SWE were individually awarded as ‘Best Academic Research Leader of the Year’. Professor Dr. S M Mahbub Ul Haque Majumder, Acting Vice Chancellor, DIU, Professor Dr. AKM Fazlul Haque, Registrar, Professor Dr. Md. 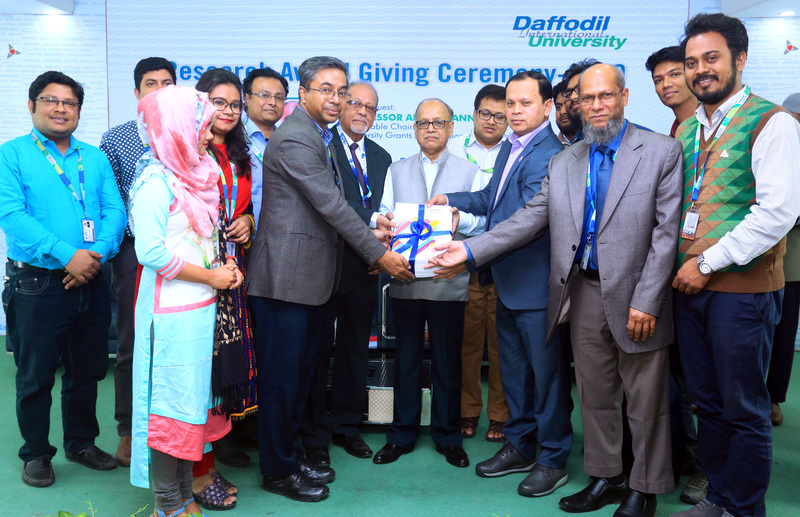 Kabirul Islam, Director & Chief of Research Division of Daffodil International University were also present at the program. While addressing as the chief guest Professor Abdul Mannan said that a complete university has to be three characteristics. One is to create knowledge and for which needs research. Second is to publish the researched knowledge in journals for preservation and third one is to disseminate the knowledge among all over the people for mankind. He thanked Daffodil International University for fulfilling those three criteria and play great contribution in research field. Professor Dr. Akther Hossain, Head, Department of Computer Science & Engineering (CSE) along with the faculty members of his department are receiving award on behalf of the department. Professor Abdul Mannan also said that most of the University of Bangladesh have good numbers of research work, but they are not focused in internationally due to lack of complete website. Ranking organizations collect information from the university website. So he urged the universities to concentrate to make a user friendly website enriched with all information. Dr. Md. Sabur Khan said that the responsibility of a university is to create new knowledge. That’s why research and innovation is must for a university. Daffodil University faculty members are always doing well in research. We will have to continue this culture and Endeavour. He urged the faculty members to come forward in research with new technology and innovative ideas and to involve the students with their research. Dr. Md. Sabur Khan also said that Daffodil has collaboration with more than 400 universities around the world. Teachers should take this opportunity and go abroad under faculty exchange program.